This issue's cover illustration is from Jenny Nimmo's The Blue Boa. Jenny Nimmo is interviewed by Julia Eccleshare. Thanks to Egmont Books for their help with this May cover. Every two years the Beatrix Potter Society holds an international study conference, usually in the Lake District (this year though it will be in Scotland). A broad theme is chosen and although this may be rather loosely adhered to it suggests a general purpose both for the meeting and the subsequent publication of the conference papers in the 'Studies' series. 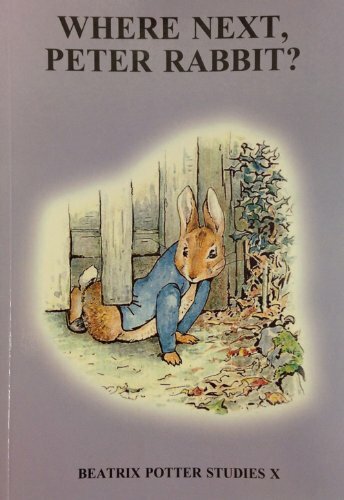 The present collection provides a good example of the latitude given to contributors, for very few of the papers speculate about what the future holds for Peter Rabbit and company. Probably the most directly relevant is Elizabeth Booth's account of Frederick Warne's plans for the already highly professional BP digital archive - a fascinating example of electronic indexing capabilities which holds out a prospect for everybody in the world soon to be instantaneously able to 'research' almost any aspect of the author's life work and influence. Readers of BfK may also be attracted to the Society's developing scheme for reading 'the little books' in schools - a collaborative venture whose creative potential was described by three speakers (although one of them may give you the shivers with a display of what look horribly like keystage worksheets). Much else in the volume gives evidence of the diversity of subjects that may fruitfully be studied in relation to Beatrix Potter's busy and productive life or to the way in which her writings have made their way in the world. A professor from Vermont (not completely au fait with the history of English children's book publishing) examines some of the 'hand-size' books that appeared in the early 1900s when Peter Rabbit first arrived. The chairman of The Copyrights Group Ltd proffers some authoritative facts about the merchandizing of Potterana. The author and gardener Peter Parker ingeniously combines a description of the plants and gardens that feature in 'the little books' with a knowledgeable account of BP's own enthusiasm for growing things. (A project for laying out a tennis-court was swiftly despatched in favour of potatoes.) Two other elements in the 'Studies' may be particularly germane to points raised elsewhere in this number of BfK. The first is a set of short papers on translating Peter Rabbit into Russian, Lithuanian and Japanese, each of which brought out problems related both to linguistic usage (Flopsy, Mopsy, and Cotton-Tail will appear to be boys in Lithuanian) and cultural context (apparently the story of Peter Rabbit had to be somewhat modified to get him past the Bolshevik MacGregors). Indeed, given the divergences apparent here one can see scope for an international conference that would occupy itself entirely with the manifold issues raised by the translation of these children's stories. The second topic - and for me the most absorbing essay in the book - was a commentary by the book-designer Douglas Martin on the methods which he adopted in planning the posh new printing of 'the little books' that was launched in 2001. His close analysis of requirements relating to all aspects of design (except, alas, colour printing) was set out with admirable clarity and might well have been illuminating for the discussions on picture-book production that were the subject of the BfK Workshop Day.